First, we’ve updated the site to organize all the games or prototypes into one category and all the unity extensions into another. Some of those extensions are likely on permanent back burner, but at least a couple will be updated regularly here on. Which leads me to the second thing: A new component available on the asset store. We’ve created a new plugin that allows you to paint grass and detail meshes onto any surface, not just terrain. While it’d be easy to add a quad each through the regular editor, the overhead from draw calls would put the editor into a crawl. Instead, you can paint as much grass as you’d like at whatever density you’d like and it combines all those triangles into much larger container objects. 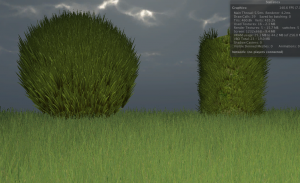 These keep the draw calls down, allowing you to paint potentially millions of grass elements into a scene without killing performance. This entry was posted on November 23, 2013, 10:03 AM and is filed under Uncategorized. You can follow any responses to this entry through RSS 2.0. You can leave a response, or trackback from your own site.